We continue our series of posts on favorite winter outings for families with children, featuring recommendations from AMC chapter trip leaders and staff. We started in the White Mountains and moved south to Boston’s western suburbs. Now we hear from Boston Chapter family trips leader Heather Hodgson DePaola with suggestions for winter outings in Boston’s southern metro area. Several of DePaola’s favorite walks — the first three listed here — are in land protected by The Trustees of Reservations. In 1890, Boston architect Charles Eliot, who would become an originating force behind Acadia National Park, proposed that a volunteer conservation organization be created to hold land free of taxes for the public to enjoy “just as a Public Library holds books and an Art Museum holds pictures.” The Trustees of Reservations conserve and care for more than 25,000 acres of forest, wetland, and open space around Massachusetts. Noanet Woodlands, Dover. DePaola and her daughter, Mckinlee consider this nearly 600-acre Trustees of Reservations preserve “home” territory and visit it in all four seasons. It’s a short drive from their home in Dover. 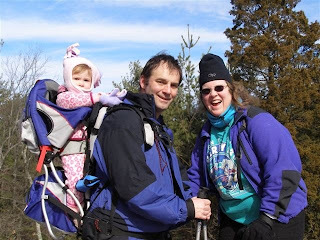 DePaola used to bring Mckinlee in a baby backpack to the top of the hill with its spectacular views of the Boston skyline. Now that Mckinlee is walking on her own, they are just as likely to explore the little ponds around the preserve. Noon Hill, Medfield. The short trail of another Trustees of Reservations preserve, Noon Hill, leads to a gentle summit and sweeping views. The DePaolas especially like the loop trail around Holt Pond. Rocky Woods, Medfield. Two brooks, many ponds, and wetlands in nearly 500 acres means there’s always something new at Rocky Woods. In the winter, that can mean exploring the many varieties of ice — the lacy edges of frozen ponds, panes of ice on the trail that are fun to stomp, ice pockets tucked away — and then sharing a winter snack at a picnic table. Blue Hills Ski Area, Canton. This small downhill ski and snowboard area is still very much in operation and makes for a great winter outing all by itself. 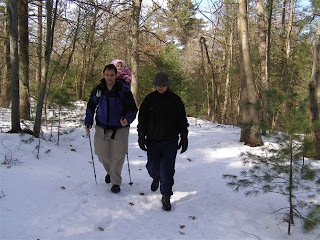 DePaola also likes the trails maintained by the ski area and nearby Blue Hill Meteorological Observatory, a one-mile uphill walk from the ski area parking lot. Check ahead for tours of the weather station. The observatory is offering kite-flying lessons on President’s Day, February 22. Elm Bank, Wellesley. The Massachusetts Horticultural Society, fondly known as “Mass Hort,” is the oldest horticultural institution in the United States. The 36-acre hands-on horticulture center offers adults and children the opportunity to experience, enjoy, and learn about plants and the environment. “Weezie’s Winter Story Hour” is held every Friday in February from 10 to 11 a.m. in the Education Building. The Charles River runs along one side of the center, and DePaola and Mckinlee often take “great strolls” along the river, where there are always ducks and other waterfowl, even in winter, and dogs along the trail for Mckinlee to enjoy. Next, we will explore winter outings for families in Connecticut, then winter walks with children in the Delaware Valley end this series. I hope you’ll share your best winter walks with us, too.